Don's sister Betty Grizzle Bertels married into one of the original 26 families who lived in Dorsey at that time. 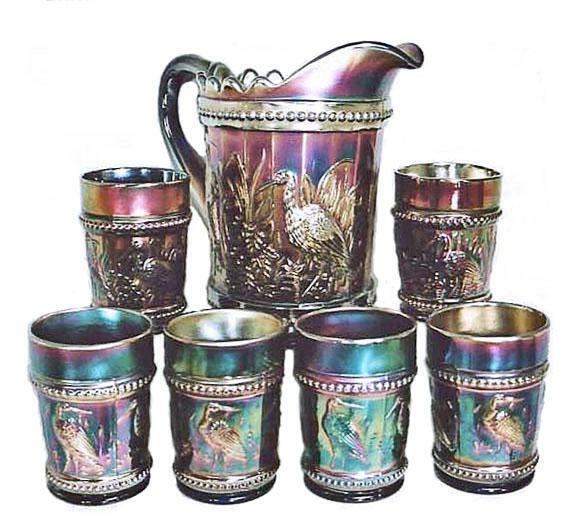 They related this story some years ago to Don, when they learned in the 1980s that he was interested in Carnival Glass. L.G. Wright purchased many of the Dugan/Diamond molds after 1931, during the height of reproductions in the early 1980s, collectors could finally acclaim Diamond as the producer of the vintage sets. The original variety claims to be one of the rarest/most desirable sets produced. Since they were produced only in cobalt blue, and Wright did not manufacture them in other than amethyst initially, it was not difficult to determine the age factor. However, in 1982, Wright produced 1,000 sets in cobalt blue carnival! While they were reported to carry the trademark, we all know that marks can be removed! Beware! Considering Diamond produced more blue elements than Dugan, we make the assumption that Diamond made the vintage sets. 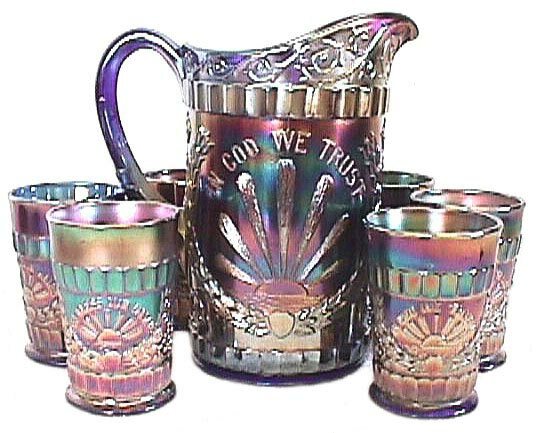 Speculation has it that the God and Home sets were marketed as a commemorative marking the end of WWI in 1918. If that be the case, we need no further confirmation that Diamond was the maker. LATTICE & DAISY - Tankard is 11.25 in. tall - Tumbler is 4.25 in. tall. LATTICE & DAISY: Dating from the 1915-1919 period, production by Diamond was confirmed when shards were discovered in the Helman diggings. 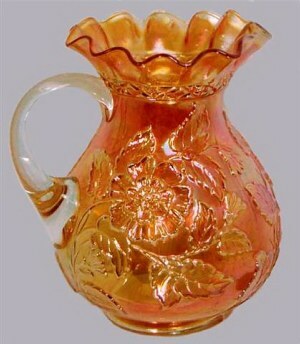 Prior to that time, the pattern had been attributed to Fenton Glass. 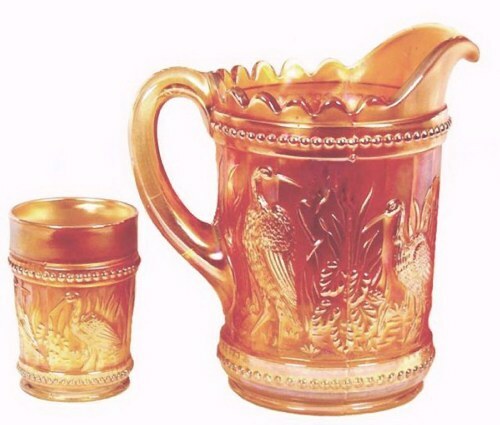 These are mold-blown tankards with separately applied handle. Tumblers are pressed. Marigold sets are light in color, but certainly seen more often than the rare cobalt blue sets, which exhibit nice multi-color iridescence. Amethyst is rarer still, with just a few examples confirmed. It is also difficult to locate amethyst tumblers! A white tumbler is known, so perhaps there remains an undisclosed white tankard somewhere out there? Berry sets are rare in this pattern in marigold. One small white berry bowl has been confirmed. 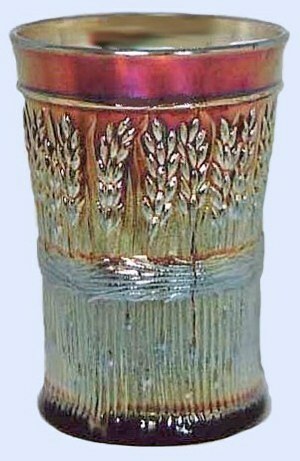 Other than a whimsey vase in amethyst, formed from a tumbler, there are no other known shapes in this pattern. 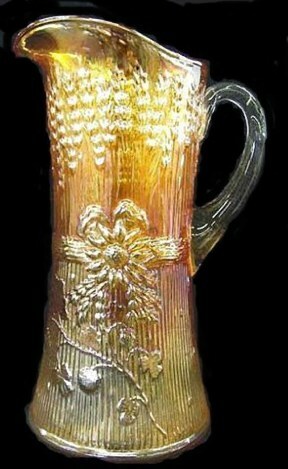 Sheaf of Wheat encircles the tankard. 4.25 in. tall x 3 in. diam. @ rim. $400. Wroda Sale - Jan. 07. 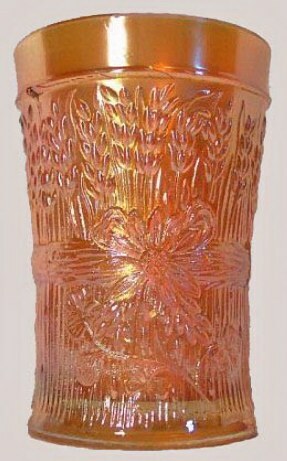 HARVEST FLOWER: Conclusive connection between this pattern and its maker was not placed until the 1980s when L.G. Wright made reproductions from the original molds purchased in Indiana, PA. Since marigold and amethyst are the basic vintage colors, (a light green with marigold overlay-tumbler is known) we lean towards Diamond as the original maker, rather than Dugan. Definitive mold characteristics lead to Diamond as well. 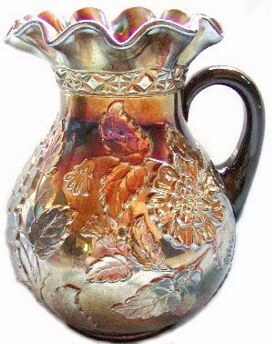 The tankards are mold-blown with applied handles. 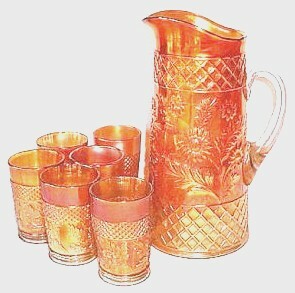 Harvest Flower tankard sets are the only known shapes in the pattern and they are quite rare. These sets have not been found advertised in any of the early Wholesale Catalogs. Wright reproductions, reportedly created by Westmoreland for L.G. Wright, are in gaudy red carnival glass. They were marketed in the late 1970s - early 1980s. RAMBLER ROSE: Production is placed in the 1914-1915 period. Known only in marigold, amethyst and cobalt blue, pitchers are mold-blown with applied handles. The water sets are the extent of pattern use and they have become quite scarce over time. Pitchers are quite thin and fragile, with breakage a very likely occurrence. Tumblers were not produced as accompaniments to pitchers/tumblers. Therefore, Butler Brothers Wholesale Catalogs issued ads offering general assortments of tumblers from time to time. This would account for the fact that tumblers in this pattern are not too difficult to locate in today's market. L.G. 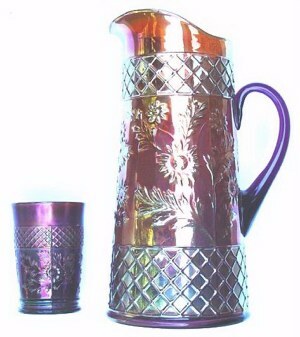 Wright reproduced this water set in purple carnival glass, along with tumblers in non-iridized custard glass. Beaded Version of STORK in RUSHES - Amethyst. STORK in RUSHES: The beaded water sets are more frequently found than those having the Lattice Band trim in place of the beads. 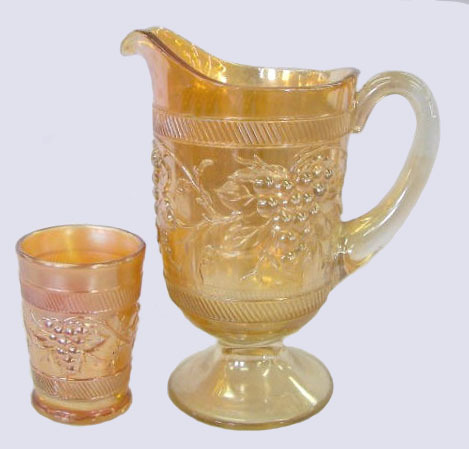 BOTH versions appear in the same assortment of various 1915 Butler Brothers Wholesale Catalog issues, leaving virtually no doubt that both sets are Diamond Glass products. Amethyst, marigold and cobalt blue are the colors to be aware of. L.G. Wright produced some very nice reproductions of the beaded water sets in marigold. Spooner, creamer and covered sugar in marigold, along with the master berry bowl in purple were reproduced by Wright, as well. VINTAGE BANDED: Firmly within the Diamond era, appearing in the wholesale catalogs beginning 1922 and continuing through 1930, this pattern enjoyed a long production period. Water pitchers in marigold and amethyst are extremely scarce. Marigold tumblers are known. 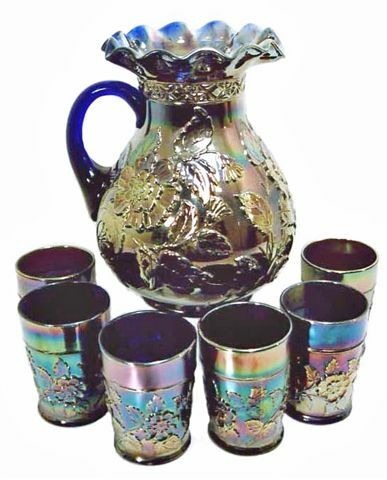 One of few pedestal-footed pitchers in carnival glass, there seem to be more of them than matching tumblers! 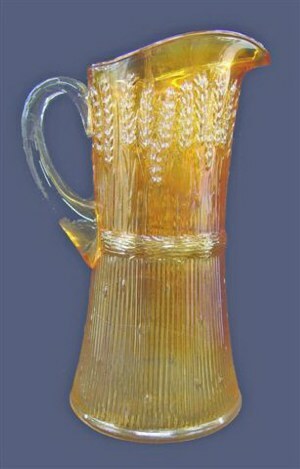 Oddly, the pitcher is occasionally found in amethyst, but there are no known amethyst tumblers. Marigold Vintage Banded mugs standing 3 ¼” high are the only other shape known in this pattern. We shall be satisfied with the goodness of Your courts. You make it soft with showers, You bless its growth. The pastures are clothed with flocks; the valleys also are covered with grain; they shout for joy, they also sing. Psalm 65 is a psalm of David, though some scholars dispute that. The event that prompted the song is even murkier, though some speculate that it was written to be sung on the occasion of the ark of the covenant arriving at Mount Zion.